Cheating in Roulette is probably the most common and easiest in gambling. One of the most popular roulette cheating methods is called ‘past posting' and dates many years back. After the wheel has spun and the ball heads for its final landing, the dealer will usually look down in order to see what the winning number will be. A player who has a sharp eye and skillful hand will use this opportunity to place their bet on the winning number. This form is cheating is most common in games that are run by one dealer. The cheater will usually remove a losing bet, place a winning bet, or switch the losing roulette bets onto another number. This method requires one to be very quick, calculating, and sharp. Dealers are well aware of this method, and if one is accused of using it, you should always claim ignorance. 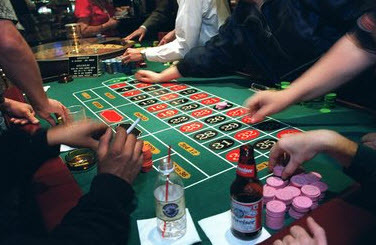 Ball control is another method that can be useful for cheating in roulette. Roulette is strongly influenced by the croupier, and therefore their actions will influence where the ball lands. Years and years of spinning cause the dealer to develop ‘muscle memory', or a consistent delivery system. It is believed that dealers are able to influence the result of a game, and navigate where the ball will fall. Observations have shown that male dealers tend to be territorial and control their spins if one wins constantly at their tables. But, there is no way to prove that a dealer is cheating you. If you feel that the dealers ball control affects you, then it is best to watch their spin before placing a bet. Building a rapport with a skillful dealer is also advisable as it strengthens your game, and in turn may help you exploit the dealer's ability. The use of concealed computers involves examining the mechanical conditions of the roulette wheel and table and using a prediction based on the computer using the laws of Newton in physics. This game could be seen as an advantage system rather that a method of cheating, but using computer devices is illegal in most casinos, and therefore it is difficult to use them. Doyne Farmer and Norman Packard, alongside a team of other physicists and computer scientists tried to create a computer that was capable of predicting the game of roulette. This was done before the use of computers was deemed illegal in casinos. A tiny computer was developed from scratch by this team of physicists, and they developed their own software that calculated various equations of motions that were involved. This software was flexible enough to adapt to any roulette wheel or game. An excellent job was done when programming this computer, but problems arose when it came to hiding the computer, and its power supply, as well as logistical problems. The building of a device like this involves a deep knowledge of mathematics, electronics, physics, as well as computer science and information theory. While physicists were in the process of trying to develop a new method, the Governor of Nevada passed a law that stated it was illegal to use any device that would assist in the outcome of a game, and that anyone caught using or even simply possessing such a device would be imprisoned for up to ten years, or be fined $10,000. Think carefully before attempting to use this method. Here is an example of a guy who almost got away with it. 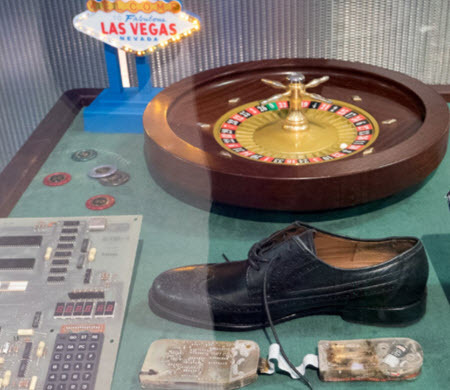 Earlier this year a Hungarian gambler, Laszlo Kovacs, installed a small computer in his shoe, activated by tapping. Using factors such as the velocity of the roulette wheel when it's spinning, the computer calculated what number would show up next. However, Kovacs ran out of luck and was ultimately arrested by Australian police for using roulette cheats. According to authorities' estimates, Kovacs collected approximately $200,000 in various casinos.Another interesting question is, would they work on other casino games, not just roulette. Nevertheless, don't get any strange ideas, as we repeat-the device is strictly forbidden.